5 mornings ago, Molly and I walked to the mail box. Along the way she saw the news paper and picked it up, unprompted by me. 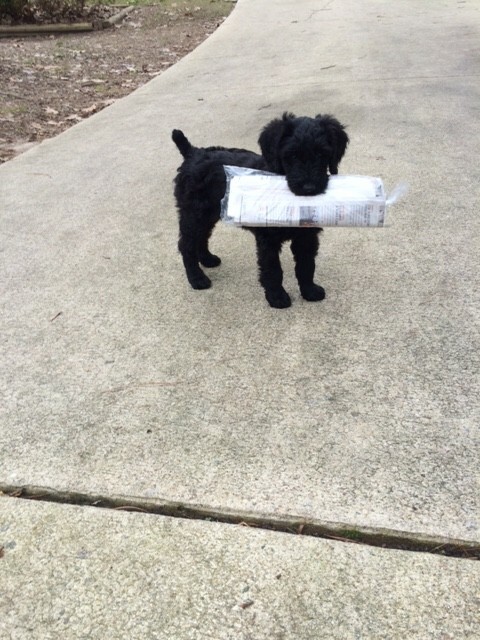 Each morning we walk down the driveway and she picks up the paper. She then takes it thru the gate into the back yard and sets it down, looks up at me then starts playing with it……LOL. It is so cute. She is soo smart. She already understands a lot of things we say, especially the words “no bite”. All I have to do is say the words! We are working on “sit”. I’m sure she will be doing this when asked in no time! We enjoy her every day. Digit finally met her. He is still a little protective when Molly jumps up on our legs, but he is learning she is here to stay. When they are together Digit “walking” around the yard and Molly running all over the yard. He cannot keep up with her. He just stands there or lays down. An 11 year old dog vs a 9 week old dog….LOL! !